[dropcap style=”font-size: 60px; color: #9b9b9b;”]T[/dropcap]he technique allows mobile robot platforms to navigate autonomously in environments while carrying out actions a human would expect of the robot in a given situation. The experiments of the study were recently published and presented at the Institute of Electrical and Electronics Engineers’ International Conference on Robotics and Automation held in Brisbane, Australia. According to Wigness, one of research team’s goals in autonomous systems research is to provide reliable autonomous robot teammates to the Soldier. 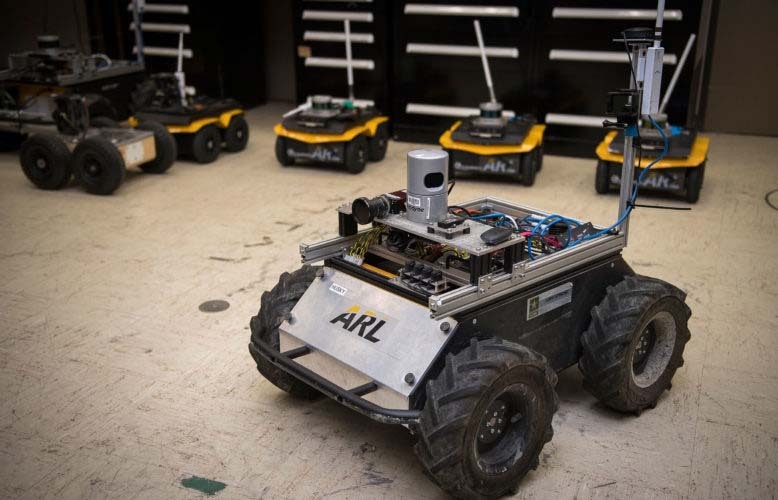 ARL and CMU researchers focused their initial investigation on learning robot traversal behaviors with respect to the robot’s visual perception of terrain and objects in the environment. This research is funded through the Army’s Robotics Collaborative Technology Alliance, or RCTA, which brings together government, industrial and academic institutions to address research and development required to enable the deployment of future military unmanned ground vehicle systems ranging in size from man-portables to ground combat vehicles. Machines can be replaced, but people can't.